Winter has arrived in the northern hemisphere, and along with it an extra dose of static electricity. But do most people know how static electricity works? Why is it more prevalent in the winter months, and how can people prevent those nasty shocks? Sebastian Deffner, assistant professor of physics, and Muhammed Ibrahim, a research collaborator in his lab, demystify static electricity in a new piece in The Conversation, republished on Phys.org and by newspapers across the United States. “Static electricity comes down to the interactive force between electrical charges,” Deffner and Ibrahim write. Electrons coat every surface, but some surfaces hold onto those electrons more tightly than others. When two materials with different abilities to retain electrons come close together, “electrons can be ripped out of the ‘weaker’ materials and find themselves on the material with stronger binding force.” The zap we feel is the electrons moving from one surface to the other. Drier air is the culprit for increased static in the winter. Moisture in the air allows electrons to flow more freely and return to their original surface without shocking anyone. But when the air is dry, “electrons get trapped on the surface with the stronger binding force,” Deffner and Ibrahim explain. 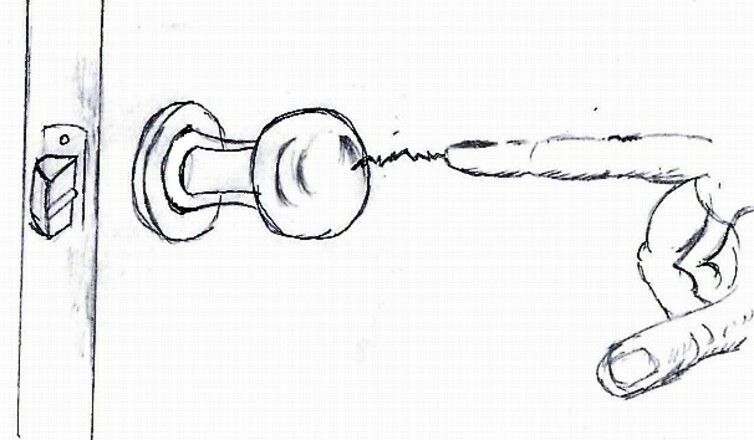 The classic static electricity “zap”; Muhammed Ibrahim, CC BY-ND. There are ways to avoid the pain, though. Deffner and Ibrahim recommend dryer sheets to take static down a notch on clothing. They also suggest running a humidifier to boost the amount of moisture in the air in a home or office. The first known recorded observation of static electricity is from the sixth century B.C., and in the 18th century people mostly took advantage of static for parlor tricks. Today, Deffner and Ibrahim write, static electricity is put to use in everything from office copiers and smartphones to cutting-edge nanotechnology. Banner: A boy’s hair gets charged with static electricity as he rides a playground slide; Ken Bosma, CC BY.